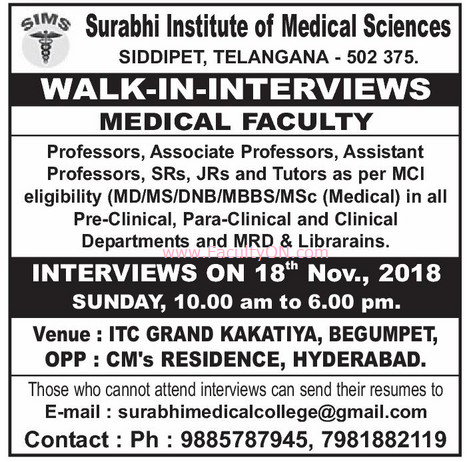 Surabhi Institute of Medical Sciences, Siddipet has advertised for the recruitment of Teaching Faculty- Professor / Associate Professor / Assistant Professor Plus Non-Faculty jobs vacancies. Interested and eligible job aspirants are requested to walk-in on 18th November 2018. Check out further more details below. About College: Surabhi institute of medical sciences has established and developed all its operations to achieve high academic standards and to provide quality and value based education in order to prepare students to face global challenges. The Management has many years of rich experience in running the reputed educational institutions with a motto of imparting education strengthened by immense quality.